SellSmart is a free app developed by Grain Farmers of Ontario to help farmers sell their barley, corn, oats, soy, and wheat in the commodity market. SellSmart provides CBOT futures pricing, as well as proprietary cash basis prices for real grain elevators across the province. Users do not need an account to access these prices: simply download the free SellSmart app and select your crops, region, and elevators. SellSmart users can also set up price alerts with the app to be notified immediately when an elevator they follow posts a new price above a user-selected threshold. 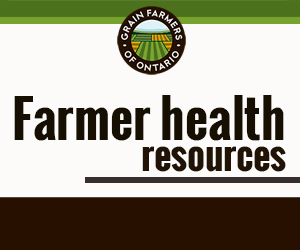 Grain Farmers of Ontario is the province’s largest commodity organization, representing Ontario’s 28,000 barley, corn, oat, soybean, and wheat farmers. The crops they grow cover 6 million acres of farm land across the province, generate over $2.5 billion in farm gate receipts, result in over $9 billion in economic output and are responsible for over 40,000 jobs in the province. Pest Manager allows you to identify, map and find integrated management options for common weeds, insects and disease in corn, soybean and cereal crops. Any pesticide use information in the app is specific to Ontario only and users should always read the product label – and ensure all directions on the label are followed – before applying any pesticide. These management options are currently only pesticide related. Pesticide options are ranked into by their average control of all pests selected. A user can also look up information on a pest and specific pesticide. The development of this app is the result of a cooperative effort between the Grain Farmers of Ontario and OMAFRA. Funding was provided through the Growing Forward 2 program, a partnership between Agriculture and Agri-Food Canada and the Ontario Ministry of Agriculture, Food and Rural Affairs. Flag My Field allows farmers to identify areas on their farm where extra precautionary steps may need to be taken when applying pesticides in neighbouring fields so as to minimize the risk of off-target pesticide drift. Farmer’s make significant investments to produce a crop and nobody wins if a crop is damaged by off-target drift. The effectiveness of this app is only as good as the amount of people using it and flagging their fields. Tell a neighbour about this app and encourage them to download and use it. After all, the app is free, so there is no downside to trying it and if it mitigates one field from inadvertent injury then it will have been worth the investment in time. Cash Cropper allows you to compare the net profitability and fertility requirements for different crop rotations within a given field. This app is powered by over 30 years of data on crop yield responses to different rotations from trials conducted by the University of Guelph. The app uses default yield values provided by crop insurance records in Ontario and uses the Ontario Ministry of Agriculture, Food and Rural Affairs cost of production defaults as a starting point for the user. The user can change any of these values to better reflect their operation. Although the yield responses used in this app are based on an extensive, long term database, there are no guarantees. But if you’re using this app, you’re likely a farmer and already know that the only guarantee in producing a crop is that you’re at the mercy of mother nature. This mobile app generates a recommendation for the most economical N rate for a corn field. It is based on more than 40 years of Ontario research and takes into account soil type, rotation, and the cost scenario (i.e. anticipated cost of N and price of corn). The app allows you to save the recommendations for each field and to generate an email report. Each of these web apps are individually cached automatically, and they will work without an internet connection. Make sure to add the individual ones you want to your home screen. Funding for this project was provided by the Canadian Federal Government, the Ontario Provincial Government, and Grain Farmers of Ontario, through Growing Forward 2. This is a statistical tool for anyone doing on-farm trials. It allows you to determine if the treatment(s) you are evaluating have provided a significantly different result (for example, grain yield), compared to your normal practices. The field statistics tool generates tables and bar charts that you can share with others via e-mail. This tool is designed to help you calibrate your sprayer. It can also calculate the optimal nozzle size, travel speed, water volume, spray volume, and boom height, based on your desired scenario. This is a beta version of the Threshold tool, meaning it is a work in progress. In this edition of the tool, users can search for action thresholds of common pests in several field crops. The Pest Manager app is the preferred tool to use for action thresholds of pests in corn, soybean and cereal crops. This is a simple tool that lets you keep track of seasonal records, whether it is planting date, weather conditions, fertilizer applications, or general notes.